It’s often said that people like improvement but hate change! It seems that change resistance is a widespread phenomenon – irrational to some, perhaps, but in many cases, entirely justified. I once attended a leaving party for a member of staff at a Government department. In his departing speech, he wryly stated that in his 20 years with the organisation, his job title and / or his department had changed 19 times (nineteen! ), yet he had done fundamentally the same things with the same customer groups every day of his working life! He added that he had given up trying to make sense of it by the third of fourth change! • Inflict unnecessary change on people. • Seldom manage the process well. • Don’t prepare people adequately, for example by helping develop in them the resilience they need to manage the seeming constant of change. The impacts of this can be acute and widespread: increased stress, lower productivity, worse outcomes all round – A lose-lose! If we review much of the academic and practical literature on change management, we might quickly form the conclusion that uncertain political and economic conditions make change a constant of organisational life; that the key to managing and adapting to that change is to have the right tools, frameworks in place, and the greatest barrier to successful change? People of course! But haven’t we lost sight of something? 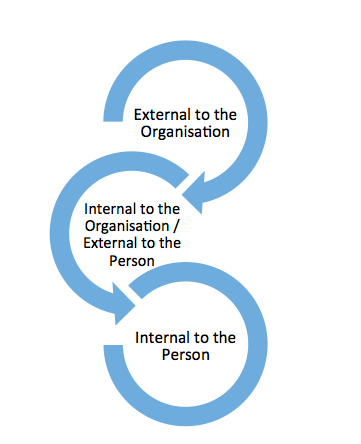 Organisations are all about people – they are run by people and for people, so surely people should be at the heart of the process? A myriad of models are available to help us manage change, from Lewin’s classic yet (perhaps inexplicably) popular Unfreeze – Change – Refreeze, through the ever-popular Kotter’s 8 Step model, to some of the more complex frameworks employed (one of the Big 4 Consultancies has a change model with no fewer than 23 steps! – More on that later!). But are these models really adequate to help us achieve successful, and perhaps continual, change? Unfreeze – Change – Refreeze – How, exactly do we ‘unfreeze’ an organisation? Surely, many are in such a state of flux, the assumption that they are ‘frozen’ seems flawed in the extreme! The N-Step models (eg Kotter) – If our organisational life is subject to the turbulence created by macro-environmental uncertainty and constantly changing industry dynamics, then is a linear, step-by-step model likely to provide an answer? It seems unlikely! o Are people really that gullible? So open to manipulation? And so willing to passively accept ‘the new vision’? Limited critique / presentation of alternatives. Practical/theoretical difficulties or the harmful consequences of change and its management methods. Change and continuity are not alternative objective states. Mechanistic understanding of change is ubiquitous in OCM. That these models aren’t really working is suggested by a number of empirical findings. For example, in Change Management in Practice: Why Does Change Fail? Jonathan Palmer suggests that only 15% of Government Transformation Programmes fulfilled their objectives, and a further 20% failed to achieve their objectives but were regarded as satisfactory. So what of the other 65%? Moreover, just speak to someone that’s recently been through an organisational change process! So, what can be done about it? How can we improve our approach to change management in a way that brings out the best in people and organisations? A greater emphasis on the softer skills rather than the hard systems of change management. o Managing sources of stress external to the organisation and handling them for damage limitation. o Turning negative experiences into positives. This is not proposed as a complete solution, but rather an effective starting point in better managing organisational change… Only if we get the people bit right, can successful organisational change follow. May 2009 – Present: Associate Lecturer delivering the Dynamics of Strategy (BB835), Management Perspectives and Practice (B716 – single presentation contracts), B628 Managing People and Organisations. November 2007 – Present: Founding Director of Eriskay Associates – a consultancy and training company based in Glasgow. Delivering over 100 engagements for SMEs, Local Authorities, PLCs and one of the Big 4 Consultancies. Porter Still Dominates our Thinking… But There Are Better Ways to Devise Strategy! But why? Let me suggest that we use Porter because we’ve always used Porter (well, since around 1980, anyway). Not because his models provide the best possible basis for understanding our industries and how we can compete to best effect. Don’t get me wrong, there’s value in all of these models, and if a tool really works for you, then use it. But, I would argue, there are better ways to create effective strategies. Let’s start with understanding our industry. We conduct a Five Forces analysis, integrate research and analysis on industry concentration, competitive dynamics and soon, we have a decent handle on what’s really going on. But what do we do with it? The answer in most cases, I suspect, is very little. It’s a nice to have, but do we really put it to good use? Rarely. • Liquidity – Still a major enabler or constraint, even in the post Credit Crunch era. 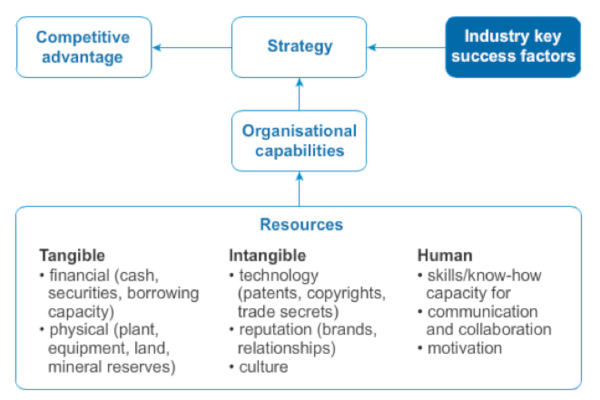 Once we have a clear understanding of Industry Key Success Factors, we can start exploring what mix of Resources and Capabilities we need to compete successfully. Here we may find a natural tendency to gravitate towards the Value Chain Analysis. This model can, of course, be very useful in helping us understand the mix of support and primary activities that can contribute to margin – in other words, how the company creates and destroys value. However, does this linear, static model really capture the reality of how firms compete successfully? In practice, it can lead to an overly simplistic representation, and we need to understand the resources and capabilities that a firm possesses in order to see how they compete. These might include some of the more everyday tangible elements of the business, but also the intangible and human resources. Porter’s model (at least, in its generic form) doesn’t appear to handle these explicitly. It’s hard to imagine a strategic appraisal of Starbucks, for example, without an understanding of the brand and other intangibles. There’s a lot to be said for using tried and tested models and at least something to be said for keeping it simple (well, maybe)… but, at the end of the day, we need to get results – a business model that works! Is Porter the key to achieving this? I suspect not. So what is? To start with, we must understand and accept that a firm’s ability to sustain competitive advantage in a given industry is inevitably based on a complex mix of resources and capabilities, articulated by the right strategies to address what the customer really wants and needs. Comments Off on Porter Still Dominates our Thinking… But There Are Better Ways to Devise Strategy! I worked as a consultant for many years before becoming the CEO of Red Hat. One of the most surprising aspects of that work was that people would open up to me, an outsider, about all the elephants in the room — but they were too polite or embarrassed to call out the obvious issues or blame their peers inside their own organizations. My fellow consultants and I would sometimes joke that just about every individual inside a company could immediately tell you what was going wrong and what needed fixing. But whenever everybody convened for a meeting to point out those very issues, you wouldn’t hear a peep about anything that could be perceived as negative. To our amazement, they were more open to hearing feedback from us, the outsiders, than from their own colleagues. Though this might be good for the consulting business, shouldn’t companies be having candid conversations — since they almost always know the solution to their problem — on their own? Wouldn’t the ability to share open and honest feedback throughout the organization improve their chances of addressing their issues, and more quickly? These are the questions that keep me up at night as a CEO. Luckily, the practices of open dialogue and providing constant feedback were already in place and part of Red Hat’s DNA when I joined the company. Because Red Hat sprang from the world of open source software — a community whose members pride themselves on delivering open and honest feedback — having candid, and what others might call difficult, conversations is the norm. We debate, we argue, and we complain. We let the sparks fly. The benefits of operating this way are immense because we are able to tackle the elephant in the room head on, but this kind of culture is hard to build and maintain, especially as companies grow. Fortunately, we’ve learned a few tips from working in open source communities about how to create and manage a vibrant feedback loop within our organization. Once you establish the practice of sharing regular feedback across the company, it begins to function like a flywheel. It’s hard at first to get it moving. You’ll need to do some substantial pushing and monitoring to get the wheel spinning. But before you know it, you’ll find that the wheel begins to turn all on its own using its own momentum. Show appreciation. It surprises me that when people use the term “feedback,” it often comes with a negative connotation. Why can’t feedback also include positive aspects as well? A great way to start a feedback loop, therefore, is to actually begin by recognizing the good work someone has done. What we’ve learned is that one key to creating a self-sustaining feedback loop is that you need to spend much more time recognizing and appreciating someone’s efforts than you do criticizing them. At Red Hat, I’d wager the ratio is something like 9:1 (research typically suggests a 3:1 ratio of positive to negative). You’re far more likely to have someone from outside your department thank you or tell you that you did a great job than anything else — and they mean it. That’s how you can begin to establish trusting relationships that are strong enough to withstand any constructive criticism that might come along. Open up. We all have the tendency, when we think we’re under attack, to circle the wagons and protect our department and ourselves. You can literally read someone’s body language when this is happening — they fold their arms, furrow their brows — and you can almost see the steam coming out of their ears. But if you want to build a feedback loop in your business, you, especially as a leader, need to lead by example and open yourself up to hear what people are saying. If someone in another department is convinced you’re not listening to them, what makes you think they’ll listen to anything you have to say to them? Yes, opening yourself up makes you vulnerable. But that’s also why we preach the idea that “you aren’t your code,” which is another way of saying that we all need to be able to process constructive criticism without taking it personally. If you can do that, you can create the kind of open and honest culture that is capable of tackling the thorniest of issues together. And you’ll be amazed that when you do listen to someone’s feedback, and take action on it, you’ll increase that person’s engagement level in his or her work. Be inclusive early and often. One of the interesting complexities inside most organizations, especially larger ones, is that they establish departmental or functional “silos” for reasons of efficiencies. And yet, they inadvertently create mistrust and misinformation by doing so. It often results in an “us-versus-them” type of situation that results in a departmental blame game. That’s why a big part of building an effective feedback loop is to get people from all over the organization involved as soon as possible in your decision-making, whether you work in finance, IT, or human resources — and often. It’s far easier and effective to gather feedback from other departments on smaller incremental issues than waiting until you’re father along where the stakes and risks have increased. If you do get some constructive criticism early on, you can more easily change course while also increasing trust and buy-in from the rest of the company. So unless you’ve got the budget to hire a consultant to do the straight talk for you, it’s time for you to lead the way by encouraging difficult conversations inside your organization. If you can tackle these three steps up front, you’ll find your feedback flywheel will begin spinning faster and faster. Otherwise, that elephant in the room is bound to trip you up sooner or later. In this article adapted from their new book, Jerry Davis and Chris White explore what makes some companies more fertile for social innovation — that is, the ongoing (rather than one-off) initiatives that have positive social impact while promoting the core mission of a business. While there are some factors that make social innovation more likely than not — such as intrapreneurs who will champion them — Davis and White find that competing for talent, strong brands, and leadership transitions all correlate with stronger social initiatives. In the course of our research, we have found that some human capital-intensive industries are more inherently receptive to social innovation than others. Accounting and consulting firms are often highly responsive to the social demands of their employees. For example, interns at PricewaterhouseCoopers championed a social audit practice. We also found that the professionals we spoke with at Accenture, in offices on three continents, consistently lauded the firm for its willingness to support innovations, from Accenture Development Partnerships to professional programs for First Peoples in Canada and support for call centers in native communities. This fits with the idea that much innovation is driven by a war for talent. Businesses that require professionals with skills in high demand are virtually required to embrace the preferences of the next generation. Firms with a strong brand to protect are also often social innovators receptive to intrapreneurs. Nike faced consumer backlash in the 1990s when malign labor practices by some of its suppliers became widely known. Perhaps most notable was a story in Life magazine that included a photo of a Pakistani child sewing Nike-branded soccer balls, titled “Six cents an hour.” Protests and calls for boycotts put Nike in the center of battles around globalization. Nike subsequently became an innovator in supply chain accountability and promulgated a rigorous supplier code of conducts, accompanied by third-party factory inspections. In early 2013, when factory conditions in Bangladesh came to light, Nike cut ties to some suppliers whose factories were deemed unsafe—even at the expense of its margins and in the face of declining profitability relative to competitors. Internal advocates for safety and labor rights in the supply chain have become powerful contenders within Nike. Because of its light footprint in Bangladesh, Nike was not among the Western brands implicated in the tragic factory collapse in Dhaka in April of that year. In consumer packaged goods, SC Johnson has sourced raw materials from farmers in Rwanda, partnered with local providers to improve hygiene and sanitation in low-income urban communities in Kenya, and chosen to eliminate harmful chemicals from its production processes in spite of the negative consequences for its market share. In retail, Whole Foods has eliminated plastic bags, worked to develop local suppliers, and opened stores with affordable products in low-income communities with limited access to fresh produce. Cascade Engineering evolved from an industrial supplier to the auto industry to Michigan’s first certified B corporation, spawning a broad array of innovations from employee management (the Welfare-to-Career program described in chapter 2) to products such as the Hydraid BioSand Water Filter, a high capacity, low-cost household water filter aimed at low-income countries. These innovations often emerged from employee-generated ideas and even through employee-led initiatives. A change at the top can also be transformative for social innovation within companies. When William Clay Ford Jr. took over as chairman of Ford, it signaled that the nearly century-old firm was open to change, from its environmental initiatives to its award-winning programs to combat HIV/AIDS in South Africa to its global Human Rights Code. New leaders do not have to have their family name on the door to encourage social innovation. In 2003, when Rámon de Mendiola took over as CEO of Florida Ice & Farm Company, Costa Rica’s leading beer and beverage producer, the firm was an old-fashioned and complacent incumbent facing imminent competition from world-class global competitors. Mendiola launched a campaign to increase efficiency and cut costs, followed by another campaign to introduce new products and increase revenues and profits, culminating in the acquisition of the PepsiCo business in Costa Rica. After building credibility inside and outside the organization, in 2008 Mendiola created a broad initiative to remake Florida as a triple-bottom-line business devoted to profit, planet, and people. He stated that most businesses are caterpillars that eat and eat; he wanted Florida to be a butterfly, which enchants and pollinates, combining business performance with social progress. The company committed to goals of being water neutral by 2012, carbon neutral by 2017, and ultimately zero waste. Its people initiatives included aggressive targets for employee volunteerism, partnering with Habitat for Humanity to build housing in the wake of an earthquake in 2009 and building facilities to provide fresh water access for villages in rural areas of Costa Rica. This approach has had a number of tangible benefits, including increased employee loyalty and retention, and, intriguingly, goodwill from potential acquisition targets, whose owners can rest easy in handing their businesses over to a company with a strong commitment to the triple bottom line. There are plenty of examples of businesses that adopt a triple bottom line and manage to be both economically and socially sustainable, and they should serve to encourage grassroots social innovation. Perhaps the coming generation of leaders will come to embrace this approach as Ramón de Mendiola did, with similar results. This post is adapted from the Harvard Business Review Press book Changing Your Company from the Inside Out: A Guide for Social Intrapreneurs. When done well, daily and weekly planning rituals can help you travel gracefully through life in a peaceful, intentional manner. But sometimes, overplanning your day-to-day activities can make you a neurotic, stressed-out person who feels like you would have been better off if you hadn’t planned anything in the first place. Maybe there’s something to be learned from bad ideas!? Some call it a depression. Some call it a never-ending recession. Some call it a disconnect or a decoupling. Some call it a not-quite recovery. Here’s the truth. Econ doesn’t have a word for whatever we’re in…because whatever we’re in flouts the so-called laws of economics. Quarterly results look great; job growth is “up;” and financial markets are ebullient. So why are so many still worse off than they were before? Why hasn’t all this “growth” actually translated into a real feeling of prosperity? And – as so many CEOs would like to know – is there any way to make money in this era of perma-semi-stagnation? Option 1: Shine it with gold and sell it to the super rich. Make it a “luxury”! Rebrand! Make the logo platinum! Add a fleet of maids and an entire army of butlers to it, if you have to! Witness the rise of the ten thousand dollar cocktail, the million-dollar pair of jeans, luxury doggy spas (Wagsworth Manor: “a luxury retreat for the furry elite”). Nokia tried it with phones—and went down in flames. The UK tried it with an entire economy, turning the once great city of London into a ghost town of global oligarchs who own entire blocks, but spend barely a few weeks there. It’s a strategy of appeasement: trying hardest to placate the strongest. Why doesn’t the gambit of merely trying more and more desperately to please the every idle whim of the super-rich work? After all, they’re the people who still have money left, right? It doesn’t work well for a simple reason: there simply aren’t enough of them, and they simply can’t spend enough on consumption, to make up for the world’s falling middle classes. Your profit margins might rise, temporarily, but soon you’ll be furiously adding another platoon of maids or regiment of butlers, daubing platinum gilding on top of the gold leaf. It’s a losing game played more and more desperately for a shrinking prize. Option 2: Sell to the rising global “middle classes” instead! Forget appeasement…let’s flee! To the very edges of the world, if we have to. Except when you think about it, that doesn’t work either. The rising “middle classes” are significantly poorer than the ones that are falling. A middle class person in India makes maybe $10k a year and a middle class person in America used to make $50K. So sure: you can flog the same junk to the so-called rising global middle classes. But before that’s a valid strategy, they’ll have to rise a lot faster and a lot further than they probably can, given a stagnating global economy. Option 3: Fleece the falling. After all, it’s true that they might be falling — but they’ve got credit cards and home equity. And on the back of that debt, says the most desperate junior vice president at Useless Widget Co, we can grow our profits! It’s the story of the “growth industries” of the last decade. The pawnshop economy. Casinos, payday lenders, private prisons, insta-on-demand-McWorkers serving everyone else who can barely afford them five dollar triplex mega soy mocha latteccinos. Fine print clauses in impossibly long contracts to hit people with hidden fees. Can you earn a few extra pennies by fleecing people? Sure you can, Scarface. But here’s what you can’t earn: an organization worth building. Consider the sad, predictable story of embattled payday lender Wonga. Your customers will despise you. Your employees will hate working for you. Society (or at least Germany, Sweden, Australia, and Canada) will fight you. You’ll be vilified…and sooner or later, the regulators will force you to change. It’s a losing battle; one fought merely for marginal pennies of short-term gain that are already shrinking. Finding cleverer, crueler ways to turn a more poisonous profit? That’s not what strategy’s about at all. Strategy is about building an institution that can compete. Competitiveness isn’t merely short-term profitability. It is about all the things that underlie lasting, healthy prosperity. It means having not just a “vision statement” but a passion. Not just a mission but a point. It’s about doing something that matters. Appeasing, fleeing, and fleecing are precisely the wrong strategies for an age of stagnation—because if you employ them, what are you, really? Just another agent of stagnation. And so, sooner or later, your destiny will inevitably be stagnation.